The Maine Board of Overseers of the Bar dismissed Michael Hein's complaint about being recorded on video while working out on a treadmill in a private health club. A central Maine man recently acquitted of a charge of cruelty to animals has lost a bid to get disciplinary action taken against a former prosecutor in the case for what he called an ethical violation. Michael G. Hein, 47, of Fairfield and formerly of Augusta, claimed the prosecutor, Assistant District Attorney Kate Marshall, violated ethical rules when she used her cellphone to record video of him secretly as he worked out on a treadmill in a private health club in Augusta. However, the Board of Overseers of the Bar, which handles complaints against attorneys, dismissed Hein’s complaint in a letter dated March 24, a week after the board received the complaint. And District Attorney Maeghan Maloney, Marshall’s boss, said Marshall did nothing wrong. Maloney said she read the letter Friday that indicated the dismissal. It is not clear whether Hein plans to appeal the dismissal. He did not respond to a message left on his cellphone or to a message sent via his attorney. According to the Board of Overseers’ 2015 annual report, “The complainant has 21 days to request that a public member (non-attorney) of the board or the Grievance Commission review the dismissal.” Preliminary figures being gathered for the board’s 2016 annual report show that 176 grievance complaints were filed against attorneys that year, and 154 resulted in dismissals. Ruffner offered instances of his days as a prosecutor when he did legwork on various cases, including stopping on his way home from work to talk to a domestic violence victim to ensure she was going to be at the trial, and investigating a scene months after an offense occurred. “I, in fact, became a witness when I happened upon a bail violation in my neighborhood,” he said. The Kennebec Journal received a photocopy of Hein’s complaint — bearing the Board of Overseers intake date stamp — in the mail. Unless formal charges are filed, the board keeps the complaint and the resolution confidential. In the complaint, Hein notes Marshall had been assigned to prosecute a misdemeanor animal cruelty case against him and that he had retained attorney Scott Hess as his defense counsel. 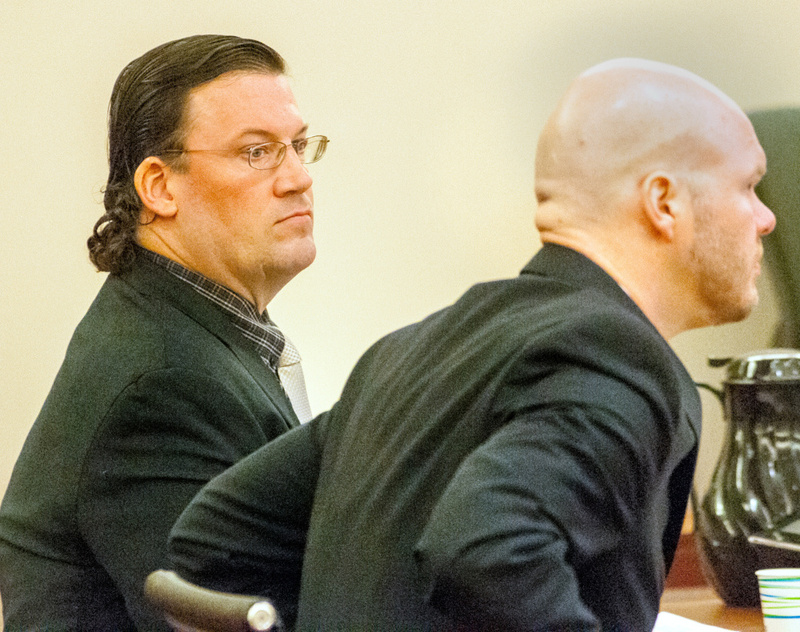 Hein had been issued a summons by Augusta police in connection with a Nov. 23, 2015, incident on the Kennebec River Rail Trail in which he was accused of kicking a leashed puppy belonging to AmyLou Craig of Augusta. While the charge was pending, the Kennebec County District Attorney’s Office informed Hess that on April 24, 2016, Marshall videotaped Hess at the health club and then burned the footage onto a CD. A copy of the video came with the letter. Hein also indicated he waited until the misdemeanor charge was adjudicated before filing the complaint. Hein’s letter says that Marshall was replaced as prosecutor in the case in May 2016. Deputy District Attorney Paul Cavanaugh prosecuted the case at trial. “I was and still am profoundly disturbed by ADA Marshall’s unprovoked, unwarranted and unethical action in secretly videotaping me while exercising at the private, secure-access membership-only club,” Hein wrote, adding that aid he did not exercise at any of the Anytime Fitness locations for six months after that and has since returned to a club location in Fairfield. He asked the board for a formal reprimand at a minimum but also a disciplinary suspension. Maloney said the board did not request that Marshall respond to the complaint and notified her in writing about the dismissal. The Maine Board of Overseers of the Bar lists special responsibilities of a prosecutor on its website, but it says nothing about evidence-gathering. Maloney also said Marshall was replaced as the prosecutor because she might have been called as a witness at trial. Hein said he was jogging on the trail Nov. 23, 2015, and recalled encountering a dog on an unusually long leash as he neared the end of his jog from Augusta to Gardiner and back. He said if he did lift his leg up, it wasn’t enough to break his jogging stride. He said he then continued on his way, with no contact with the dog, nor with any words exchanged between him and the dog’s handler. Craig said she exchanged words with the man who kicked her dog. Hein is well known in local political circles as a conservative activist. He was fired from the Christian Civic League of Maine in 2010 and later took the organization to the Maine Human Rights Commission, claiming that it had retaliated against him for alleging that the group had an illegal working relationship with a staff writer. The league later was cleared of wrongdoing. In July 2012, Hein was sentenced to serve seven days in jail after pleading guilty to a charge of willful violation of the Maine Clean Election Act. Prosecutors said Hein tried to qualify for public financing under the Clean Election Act and needed qualifying contributions of $5 each from 60 registered voters in House District 57, which at the time included part of Augusta. Hein admitted that he had broken the law by paying for those contributions out of his own wallet. In 2006, Hein made headlines by leading a protest against the use of live models in a downtown Augusta lingerie shop called Spellbound. He asked police to investigate what he described as indecent activities at the store and said he worried about school buses that passed by the windows. The store closed later that year after about a year in business. This story has been corrected from a previous version.